Dance—an art form whose energy, grace, and wordless emotion could have been designed expressly for film—has often served as a cinematic gateway drug to the surreal and supernatural. Whether as a vehicle for narrative flights of fancy or a shortcut to the portrayal of obsession, dance is visceral and physical, providing a unique emotional connection for an audience. This isn't to say that every time Fred and Ginger took the floor they were in a science fiction movie—but even they couldn't resist the occasional magical-garden dream sequence. The inevitable melding of these two tropes happens when the dance begins to bleed into life, and characters lose sight of the line separating performance from reality. Many films have used this device to underscore another theme: Black Swan used it to highlight the tolls of self-recriminating perfectionism, and The Red Shoes used it to highlight the perils of being a talented woman surrounded by controlling jerks. However, the director most devoted to the intricacies and opportunities of dance must be Carlos Saura, whose dance films act as studies more often than narratives. He explored the line between life and performance most intricately in his Flamenco Trilogy, three stylized films made between 1981 and 1986 that each use flamenco as character study, as surreal narrative, and as commentary on devotion to art. The trilogy seems crafted for this purpose: though the production design in each film is slightly different, there is an overarching pared-down aesthetic, and though each film stands alone and focuses on different characters and storylines, the lead cast remains largely the same (including flamenco legends Antonio Gades and Cristina Hoyos), strengthening the sense that the trilogy is a single meditation, seen from three perspectives. The first film, Bodas de sangre (Blood Wedding), is most directly focused on the performance it contains. It starts as a documentary about the flamenco "Bodas de sangre," completely with documentary-style voiceover. In short order, the dress rehearsal (staged in a studio) becomes its own narrative, an archetypal story of a woman promised to a man she doesn't love, with predictably fatal consequences for both her lover and her husband. The leads never break character, but the company gathered in the corners forms a de facto audience. Often engrossed, sometimes disinterested, these dancers with minor roles fall into character and out again. It's a constant reminder of the construction of performance, of the inevitability of artifice no matter how skillful and passionate the execution. At movie's end, as the bride stands above the fallen men, the film fades to a sepia-toned cast photo in which the bride and groom are still in character but the surrounding company is not; it firmly draws the line between performance and reality. A different take on this thin line emerges in the trilogy's third film, El amor brujo (A Love Bewitched). This film, following a single narrative and enacted by dancers who never break character, is the closest of the three to a traditional musical format. Interestingly, the plot itself is supernatural: Carmelo loves Candela, but she's promised to another man (leitmotif of this trilogy: Gades and Hoyos can't catch a break); when hubby Jose is murdered, Carmelo is falsely sent to prison, and Candela dances at night with Jose's ghost. When Carmelo returns, he woos her back to the real world by helping her banish the spectre of Jose. The film is the trilogy's most naturalistic (as far as movie musicals are ever "naturalistic"), though it is still a movie where women doing laundry burst into musical numbers, and Carmelo is shuttled to prison for a crime he didn't commit without any justice system involved. Here, performance and reality are interchangeable. Dance is often not a metaphor—Carmela quite literally flamencos with Jose at night, and when the townspeople gather to banish the ghost, it's the dance steps that are meant to drive him away—and when it is meant as private expression, the townspeople freeze or scatter, highlighting the artificiality of a performance meant to be invisible to the outside world. El amor brujo neatly bookends the trilogy by subsuming a distinction that Bodas de sangre went to great pains to make. Between these two seemingly opposite viewpoints, however, there must be a bridge, a film in which the line between performance and reality is challenged and defeated. And Carmen, the trilogy's middle film, eloquently posits the bridging question: When it comes to something you love, is there a line to begin with? Carmen is about choreographer "Antonio" and teacher "Cristina" putting on a production of Carmen. All other dancers and musicians are referred to by their real names, with the exception of Laura del Sol's "strange and savage beauty," "Carmen," a hint of the ways in which the movie intends to blur textual distinctions. 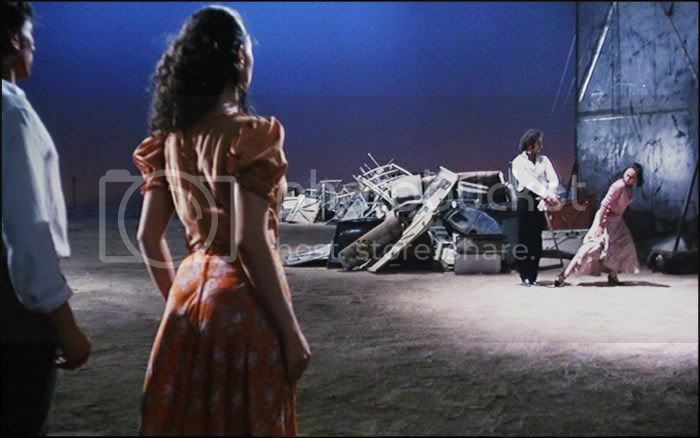 As with Bodas de sangre, characters often fall in and out of character; however, there are no indications given as to whether the audience is watching something staged or something intended to be real, and as the movie goes on, scenes that appear to be rehearsals are revealed to be something else entirely, or they bleed into what remains of reality. Interestingly, no explicit discussion is ever made of obsession with one's work, or quests for perfection. 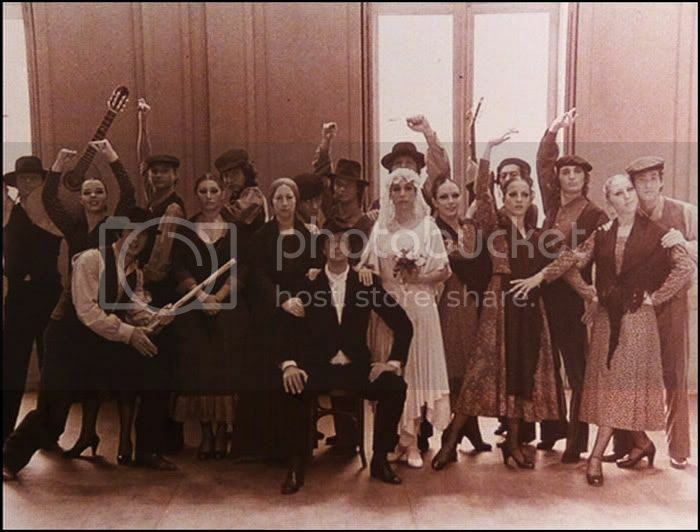 Rather, as the dancers progress (both through the film and through the chronologically rehearsed scenes from Carmen), they helplessly drag more and more of their performance into their lives. A musician's birthday party is scored to the toreador's entrance, as Carmen appears in full costume, flirts with the birthday boy, and then greets her estranged husband, just released from prison and visiting her at the studio. Moments later, he's caught up in a scene with Antonio that reads as both a dance number and a stylized fight. It's a rehearsal—but the scene depicted appears nowhere in Carmen, which only enhances the sense that performance is informing the dancers' lives more than the reverse. Reality degenerates further (with Bizet's score increasingly prominent) until the offstage scenes read as continuations of, and not respites from, the drama unfolding in Carmen. By movie's end, when Antonio stabs Carmen to death during a break in rehearsal amid an oblivious dance company, the dancers and their material have merged utterly. Though the films lack the special effects of their flashier counterparts, Black Swan and The Red Shoes, Saura's Flamenco Trilogy is nevertheless speculative, with dance a crucial element that deconstructs, informs, and propels the narrative. Each film uses the expressiveness and immediacy of dance to chip away at the distinction between performance and reality until it's a single, inescapable beat.